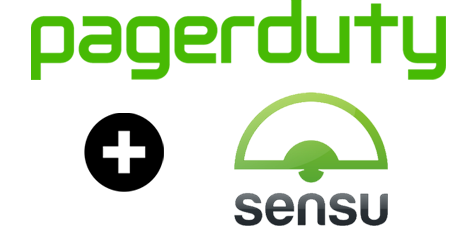 This guide will go over setting up Sensu to trigger pagerduty alerts (services). It also assumes you have a Sensu Master/client set up. There is a gem called redphone its github page is at https://github.com/portertech/redphone . It is used to support pagerduty, pingdom, loggly, and statusPage. All the API request are done over SSL. Before I get too far into this I want to use the redphone gem and create a simple ruby script trigger a pagerduty alert. 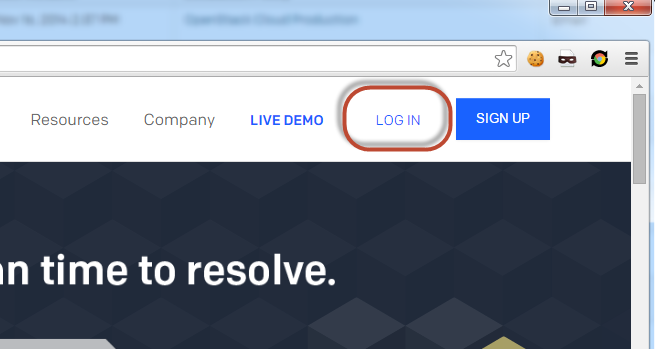 Head over to http://www.pagerduty.com/ and login to your account. I am going to create a new temporary API service to use for this test. Here is how to go about that. Give it a name, select an Escalation Policy. 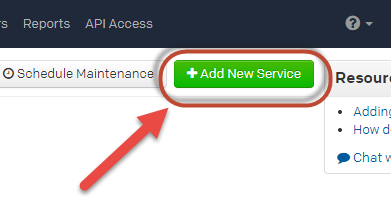 Set the Integration type to Use our API directly and click Add service. Copy the Service API Key. For purpose of this write up I will use 999XXXXXXXXXXb1 as my key. 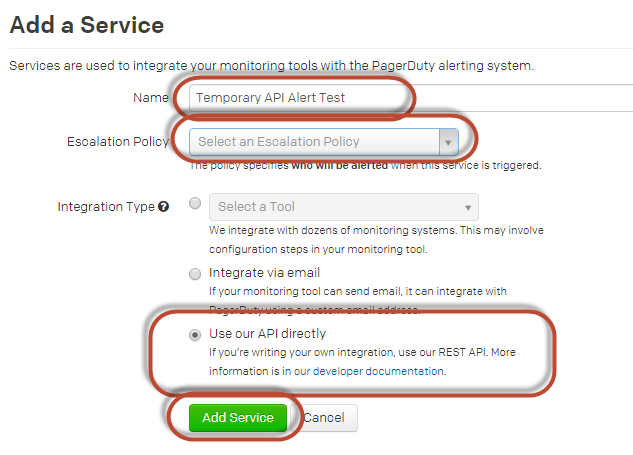 Trigger the pagerduty alert. This script in no way will use Sensu, but it will use the Red Phone gem I installed. :description => "This is a Test Alert from Patrick"
puts "Error issusing pagerduty '" + response "'"
It successfully triggered my alert wahoo! 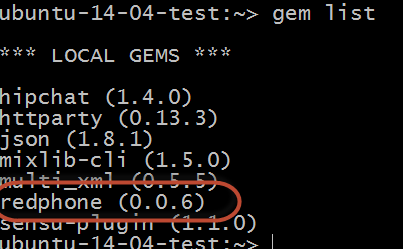 Now that I have figured out how to use the RedPhone gem I need to figure out Sensu Handlers. Looking over this page there are several different types of handlers, pipe, TCP, UDP, AMQP, and Sets. For my near term purposes I think I only really need pipe and sets. Pipe handlers execute a script and pass the event in via STDIN. Sets are used for grouping handlers. It’s a way to send the same event to several handlers at the same time. For example if you want an event to two different Pipe handlers, one which sends a message to HipChat and one that sends an email, you can use a set handler. I am not going to use a Set handler in this document, but I thought it worth mentioning. It still requires a handler and a "pagerduty" json setting. Replace the api_key with your own. Then I have to add this handler to a check. In my case I had a check called check_file.json I had created before, so I will edit that. All I did was add the "pagerduty" handler in the handlers section. To trigger my check_file check I just need to remove a file from my home directory. After 3 occurrences the handler triggers. And it worked! The pagerduty service was triggered! I immediately acknowledged the issue. Bringing back the file resolves the issue in Sensu and Pagerduty. That is not how I want Sensu to do. I do not want Sensu to Resolve any pagerduty service alarm, only to trigger them. So that means I need to tweak some code. Here is my tweaked code. This code worked, it triggers a pagerduty alert but does not resolve it. Playing with the handler for a bit and looking at the logs I saw this message. Only handling every 30 occurences. I found this post https://github.com/sensu/sensu/issues/613  which mentions that if you are using the sensu-handler this is the expected behavior. The default is to only trigger once every 30 minutes (after the initial trigger…. The initial trigger delay does not count). I ran a little test. I triggered a pagerduty alert and acknowledged it. Then let my sensu alarm run for 30 minutes. At the 30 minute mark the pagerduty handler triggered again. All it did was add a "Triggered" event to the current open triggered alert. So no new alert was created, which is exactly the behavior I was looking for. 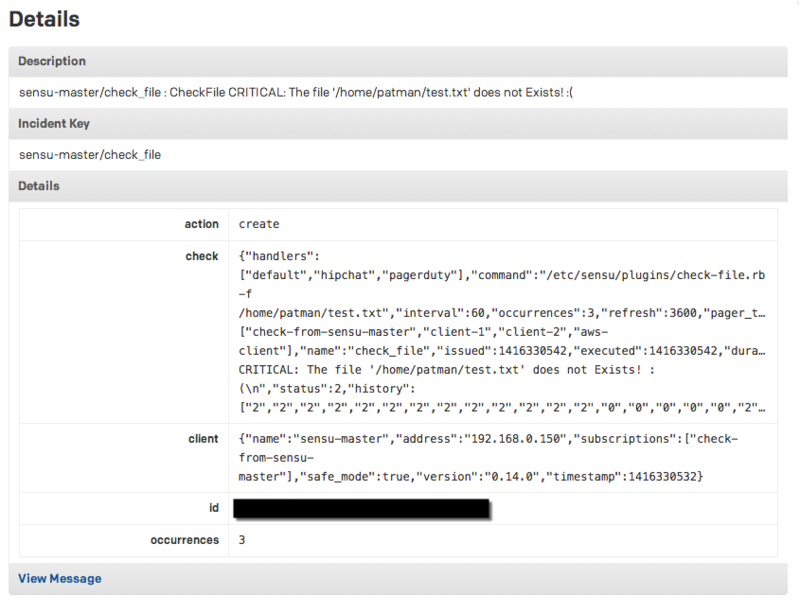 If I leave the service alert in an acknowledged state and fix the Sensu check (by creating the file again). Wait for it to resolve then remove the file again (to trigger the incident again). At this point I still have an open, but acknowledged, incident. The new trigger does not open a new alert, but just add another "triggered" event to the current open triggered alert… Not quite what I want… I need to think this through and play with it. 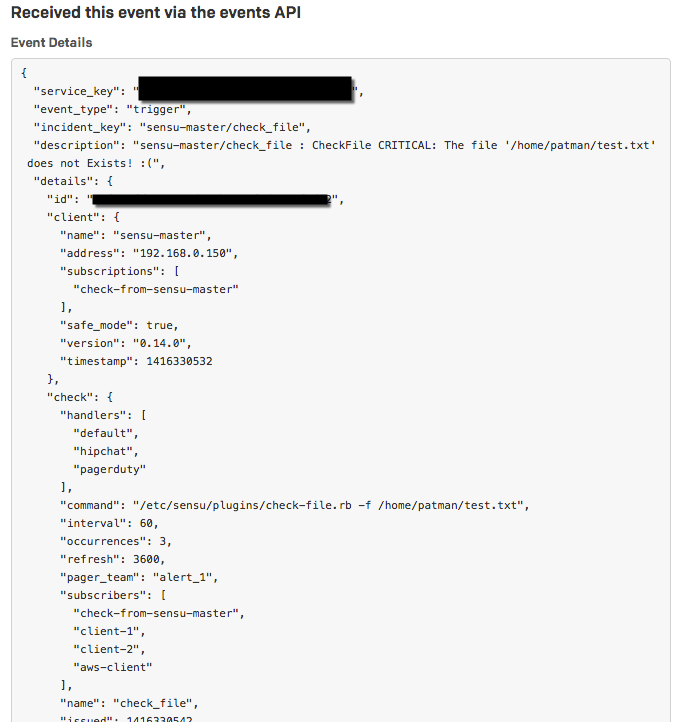 Looking at the pagerduty I can see that it has the same incident key… Maybe if I had a different incident key it would issue a different alert? Which works the same way as my last check but looks for a different file. If I remove the first file and trigger the alert and acknowledge it. Then I trigger the second Sensu alert, do I get two alerts in pagerduty? Yes I do! So, all it needs is a unique incident Key! This actually works exactly like I want it to. 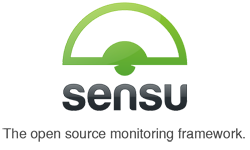 I want each type of Sensu Check to only have one open pagerduty alert at a time. If an alert is open and it triggers again I want it to be absorbed into the last alert. But if you don't want that and you want each one to trigger a new alert you could put a timestamp in the incident key. The following code does exactly that. One problem with this is that it would trigger a new incident every 30 minutes when the default handler timer goes off. To fix that you could override the default timer. Add a "refresh" to your check. And add a refresh variable. 43200 seconds is 12 hours. The handlers for this check will only re-run every 12 hours. That may help out. But for me I will probably set this to 3600 and not use the epoch timestamp. What if you want to have different Sensu checks and you want thos checks to trigger different pagerduty service alerts? Luckily someone thought of that when writing the pagerduty.rb code. You can designate a pager_team in your check and use that pager_team's API alert key. This makes it easy to have specific pagerduty alerts triggered per Sensu Check. Replace the api_keys with your own. And use the team names you created here. Now I effectively have a default pagerduty alert and two specific alerts that a check can use if the check designates the pager_team. Bringing back the file resolves the issue. As a test I am going to edit my second Sensu check and have it use a different alert and see how it works. Now let me see if I can trigger these two different Sensu alarms and have each one in turn trigger its own pagerduty service alert. Perfect! 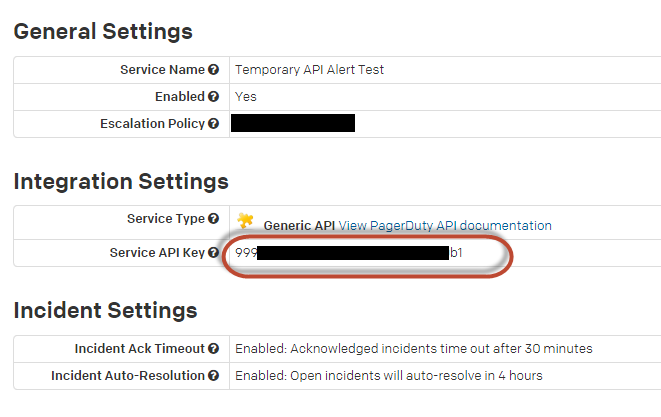 It created two different pagerduty alerts like it should! I like the Description, but it would be nice to be able to append a message to it. Which is not really what I want. So I need to tweak the code a bit. If they are not present in the check the normal description and message will be sent. 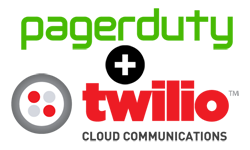 In pagerduty the message is appended and the URL is clickable. Looking at the incident details the Message shows up just fine and the URL is clickable. Perfect! That is exactly what I wanted. I think that is enough for this write up, hope it helps someone.